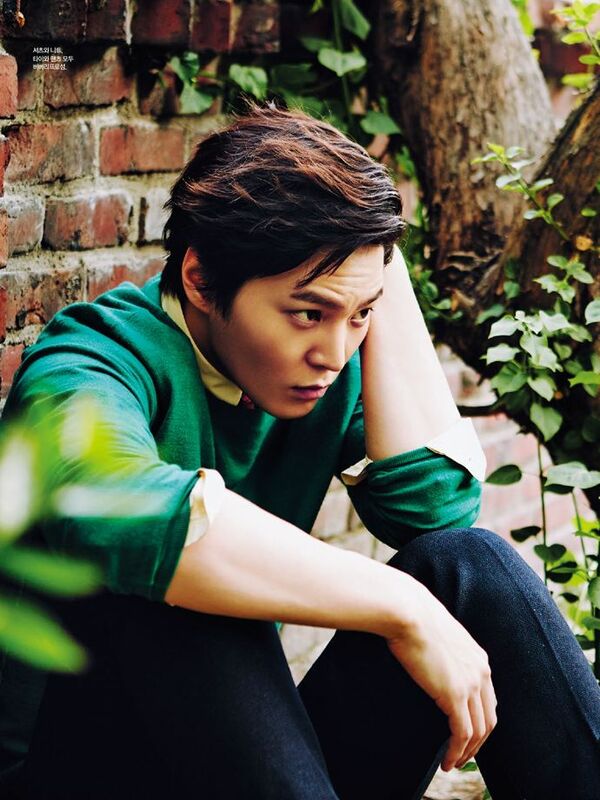 Joo Won 주원- Welcome Back ! I came to check if someone had shared all (or some of) the goodies from the army fest, but it appears that we spend more time in Instagram nowadays I love reading posts here but writing a one takes so much more effort. Here are my favorites from the bunch! I guess we’re all a bit busy at this time of the year, with school and work and everything. Fighting everyone! Remember to take care of yourself when the life gets hectic. I’m currently watching three different dramas and none of them are Joowon’s, so there isn’t much to update from my side. I’m sure that now that his birthday (September 30th) and The Ground Force Festival (October 5th) are nearing, there’ll be more material to write about on this forum as well Thank you for sharing! I think so I’m happy he’s eating well, he needs the energy so that he can do well at the military and stay healthy! Loving this video clip; is there any cuter way to wish you a good night? Haha this is fun! My guess is that Joowon is the one on the far left. Because of that lean build and body language looking so familiar. I can be wrong though! Another poster! I’m so in love with Joowon’s hairstyle Me too! I can’t wait to see their interactions @kittyna Do you know if they broadcast or live stream these festivals? I think Joowon really has the talent of choosing great dramas and people to work with. He doesn’t avoid taking risks, and as the result we sometimes get these amazing dramas like Gaksital and Good Doctor. Now I’m embarrassed... thank you for correcting me Korean (or foreign) names are hard to recall, especially if you have a bad name memory like I do. I’m not a fan of Kim Ah Joong, but she’s adorable and a good actress, and I like her style very much. This is the video I was looking for. Thanks for sharing this! I think many ROKA divisions are having holidays at this time, but it’s totally possible they met because they’re preparing for an event... can’t wait! EDIT: I had to come back and add these here coz omg! I watched Special Investigation Unit and it was surprisingly good, although it could’ve been ever better if its pace had been a little bit slower. I don’t know why many Korean movies feel sometimes too rushed. I find watching K-dramas better for that reason. But Joowon did great job in his first movie role in S.I.U. His character, Kim Ho Ryong, would’ve suited very well in TV series like Criminal Mind. Such a pity that it was only for a short time for a movie role... maybe they’ll make a sequel? I didn’t return to My Sassy Girl yet, instead I watched almost all subbed VLIVE videos from Joowon’s channel. From the beginning until the time he had started filming MSG. I’ll watch the more recent videos when I start watching the drama, but here are my top 5 videos so far (excluding previously mentioned LieV video, which is also a must watch): *Joowon’s Lunch Time Live* Joowon’s mother sent a surprise lunch box to her son during Yong Pal’s filming https://www.vlive.tv/video/1422 *Joowon’s Week 1* Yong Pal’s ending party, talking about the most popular lines/scenes from the drama with actor friend Min Jin Woong, who plays Joowon’s bodyguard https://www.vlive.tv/video/2191 *Joowon’s Her* Revealing the winner of the audition for female lead on My Sassy Girl (who isn’t Oh Yeon Seo I was so confused when I started to watch the video since I hadn’t known there had been this kind of auditioning/voting process for choosing the leading lady, nor that the actress had given up on the role. That must’ve been extremely stressful time for everyone.) Side note: Joowon looks so yummy here! https://www.vlive.tv/video/10314 *Joowon’s V Life (feat. Fan)* 1 year anniversary on VLIVE https://www.vlive.tv/video/12266 And I saved the best for last *Joowon’s Life Log Ep. 2* Feat. friends Lee Sae Wook, Shin Joo Hwan and Min Jin Woong https://www.vlive.tv/video/14893 On these videos Joowon mentions many times how he’s been working out a lot, but still he choses to act in a drama where he wears traditional clothes and is covered with layers and layers of fabric from neck to ankles... why? So cruel. Okay, now time for a few pics from the instafeed. Have a nice week ahead of you, everyone! Thank you so much @soomoi I watched it and almost fell asleep because Joo Won made me feel so comfortable and relaxed Although I was a bit flustered since one of the cameras was zooming so close... those soft lips... that lustrous skin *fans herself* I still haven’t seen all of Joo Won’s vlives and this one I had completely missed. It’s great that they provided English subs too. Thanks for the info. I kinda have a thing for rookie actor Joo Won now that I’ve seen him on King of Baking and Ojakgyo Brothers I’ve seen only the beginning of S.I.U. but would like to see the full movie. I haven’t been able to find it yet with the quality I’m satisfied with. I could buy it but does it have English subs? I have to check that. Let’s just be honest and say that the script was bad... You can make a movie with good characters, whatever the genre is. But it was interesting to hear Joo Won using dialect, and also for the first time his character wasn’t a handsome young man, but someone who didn’t care about his appearance or himself a one bit. He only wanted to protect and provide for his little sister. Their relationship was what was beautiful in the movie... Another thing from the LieV I just watched: Joo Won talked about choosing My Sassy Girl because he had found out that his fans wished him to act in a historical drama. Although I didn’t love MSG and didn’t finish the drama, I should definitely give it an another chance. Since Joo Won chose it thinking of his fans. I promise to post something during your absence because I don’t want to let you down We’ll be missing you! Oh I can’t wait to read it! My thoughts are still lingering on that drama, maybe because it was with me for so long, and Tae Hee and Ja Eun’s story had such a strong impact on me I tried to finish 7GCS but after watching a few more episodes I had to admit that this drama isn’t for me. There’s nothing wrong with Han Gil Ro, I enjoyed Joo Won playing such a fun character, but everything else was just... not comparable with other dramas he’s been on. So now I’ve started watching a couple of other dramas. One is Your Honor with Yoon Shi Yoon from King of Baking; he’s the reason why I started watching the drama, and I’m glad I did, since it appeared to be rather good! Both lead actors, Shi Yoon and Lee Yoo Young, are really great and have a nice chemistry together. I didn’t know Lee Yoo Young before and when I googled her I found out SHE’S ACTING WITH JOO WON in Fatal Intuition!! What a coincidence! Fatal Intuition is on my watch list, but since I know it’ll be an emotional and maybe a bit distressing movie experience, I have been dragging it. I need to be ready for that famous crying scene... Since I share here my findings as a new fan of JW, here’s something I saw earlier and had fun reading, many pretty pictures too! I had to search for that HT clip What a contrast between the shy, visibly nervous but adorable Joo Won and the (kissing scene) acting Joo Won, he’s truly amazing! I’m a real sucker for romance films and kissing scenes are really important to me. In some dramas Joo Won’s kissing scenes aren’t particularly outstanding, but I know it’s because that’s how most kissing scenes are done in K-dramas. But I’m happy that every now and then, there are exceptions like the ones you mentioned... I happened to find an interview I hadn’t seen before, and it was very interesting one, especially towards the end. Joo Won mentions The Notebook being his favorite movie and how he wants to experience similar romance in his own life as in that movie: the great love, pure love. I love how JW carefully explains his thoughts always so honestly and so that there’s no misunderstandings. I could watch him talk for hours He’d make a great professor one day (he said he wants to teach acting when he’s older). 6 months until he’ll be discharged, maybe start filming his comeback drama or movie during spring/summer, to be released in late 2019 at the earliest... We’ll have time for many Joo Won drama rounds before that. I still haven’t finished 7GCS and My Sassy Girl, and there seems to be tons of material on JW I haven’t seen yet. I’ll come back later to read your fic, thank you for sharing! Thank you for sharing your favorites @kittyna Of course I’ve been browsing Instagram today and enjoyed the fresh updates on Joo Won His charms don’t disappear even in the military I’ve almost finished Ojakgyo Brothers, only a few more episodes left, meaning drama marathons at nights for almost two weeks in a row (I’m so proud of myself haha ) I even watch it on the bus on my way to work and back to home... Actually, this drama is such a stress reliever I don’t know what to do when it ends. I’ll be back later to share my thoughts about the drama and our sweet silent hero Hwang Tae Hee!